Men in Blue had funny moments in the bus on their way to the stadium. Indian cricket team is all set to kick off their month and half UK tour with first of two T-20 game series against Ireland today. However, on their way to the country, the Men in Blue had funny moments when all-rounder Hardik Pandya turned TV anchor mid-flight and interviewed his teammates that included captain Virat Kohli and MS Dhoni. 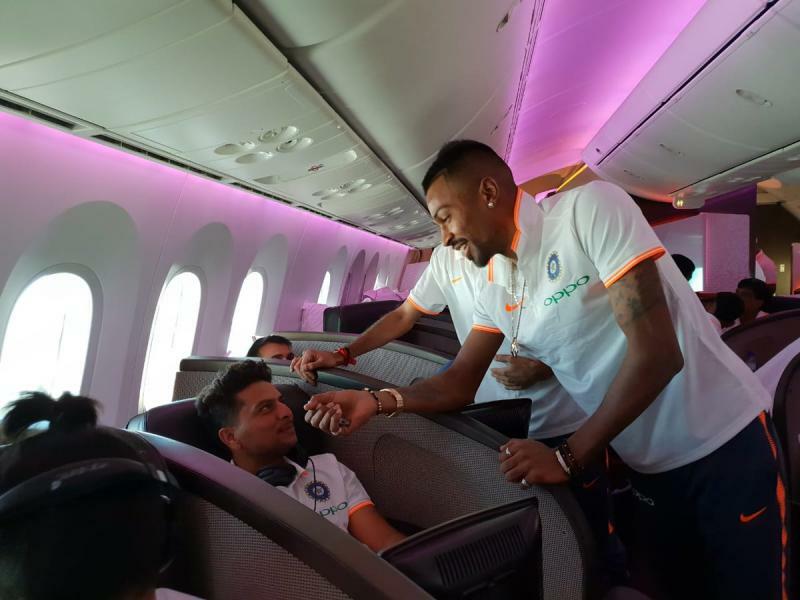 With a mic in hand 27 year old Pandya, along with Yuzvendra Chahal walked around the plane and spoke to some of the members of the squad. It started with Virat Kohli who was asked about the atmosphere within the team before the start of the series. In his reply, Kohli said that he is looking forward to have a good series against both Ireland and England. After Kohli both on them moved on to have a small interaction with seamer Umesh Yadav, chinaman Kuldeep Yadav, and Manish Pandey. When they moved to interview Rohit Sharma, the Hitman, asked Chahal to get a deodorant as he was sweating too much. The trio shared a laugh but as Pandya went close to MS Dhoni and said, “Hi, Mahi Bhai”, the wicketkeeper-batsman ignored him ompletely and continued to stare at his screen and offered him a chip from his table and gestured him to go away. An embarassed Pandya said, “Bye, Mahi Bhai” and walked off. Just to tell our readers it was all meant for fun for team India members and they need not take it seriously. India will play two T20Is against Ireland on June 27 and June 29, followed by a three-T20I, three ODIs and five Tests series against England starting from July 3.